Quality of life for women treated with a more targeted radiotherapy treatment – called accelerated partial breast irradiation – is at least as good as quality of life for women treated with standard radiotherapy, according to research presented at the ESTRO 37 conference and published simultaneously in The Lancet Oncology . The treatment uses small tubes to deliver a higher dose of radiotherapy directly to the site of the tumor over a shorter period of time. Previous research shows that it is just as effective at treating early stage breast cancer as radiotherapy to the whole of the breast. Researchers say the targeted treatment, which takes a week, is a good option for women with early breast cancer, especially those who would struggle with the three to six-week schedule of traditional radiotherapy. The analysis of quality of life data was led by Dr. Rebekka Schäfer, a clinician in the department of radiation oncology at University Hospital Würzburg, Germany. It involved more than 600 women treated at 16 hospitals across Europe who all had surgery to remove an early stage tumor. Around half of the women received whole breast radiotherapy while the other half received the accelerated partial breast irradiation treatment. The research was part of a larger study that has already shown that the treatments are equally good in terms of survival and preventing cancer recurring in the breast. Dr. Schäfer said: “This treatment focuses only on the area of the breast where the tumor has been removed and so it offers a number of advantages. 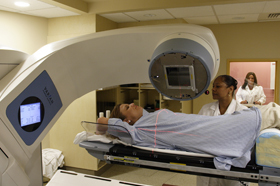 It allows us to deliver a higher dose of radiation to a smaller area, which means the course of treatment is shortened from three to six weeks down to one week or less. It also makes it easier to avoid unnecessary radiation to other parts of the body, such as the heart and lungs. Researchers questioned women about their symptoms and quality of life before and after their radiotherapy treatments, and at regular intervals for up to five years following treatment. They found that women’s quality of life was equally good in both groups and remained so over the five years. Symptoms of breast swelling and pain, and skin problems of the breast were worse in women treated with whole breast radiotherapy, especially immediately after treatment and three months later. Swelling and discomfort in the arm was also somewhat worse in the women given standard treatment. Dr. Schäfer added: “More and more women are surviving breast cancer for longer and longer, so we need to be sure that treatments do not detract from their quality of life in the long term. The researchers plan a ten-year follow-up of women in the trial to see if quality of life remains good and to see if there is any difference in cancer recurrence between the two treatments. Abstract no: OC-0326, “QOL after APBI (multicatheter brachytherapy) versus WBI: 5-year results, phase 3 GEC ESTRO trial”, Highlights of proffered papers at 12:40 hrs (CEST) on Sunday, 22 April, Auditorium. The trial was funded by German Cancer Aid. ESTRO 37: Accelerated partial breast irradiation offers good quality of life, fewer side effects. Appl Rad Oncol.